There was a time decades ago when I would make poppy seed cake using a cake mix; and — ok I fess up — Harvey Wallbanger cake using a cake mix; and lots of other concoctions using cake mixes that I wouldn’t think of doing today. Except this one. While I long ago moved past those commercial products and have prepared my own cakes from scratch for years, this cake mix holds a spot near and dear to me. It’s the cake I loved the most growing up and the one I always requested my mother to bake for my birthday. She baked it in a heavy duty aluminum pan. And she used a cake mix. 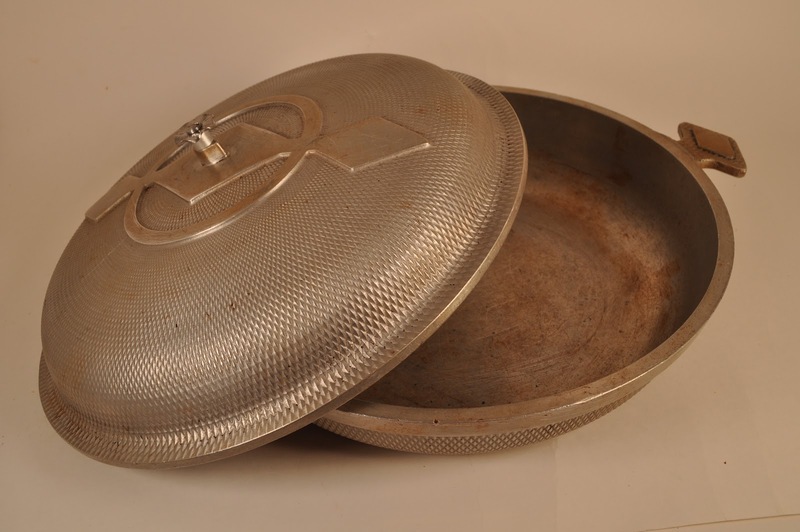 She had a whole set of these pans as a young bride in the late 1940s. This is the one that survived and this is the one I inherited when she died. There are lots of childhood memories in this pan. I can still remember the brown sugar dissolving into the melted butter and how I’d try to snitch a spoonful of the sweet mixture before my mom shooed me away. How she’d always plunk the frighteningly red maraschino cherries into the center of the pineapple rings even though I always picked them out later. 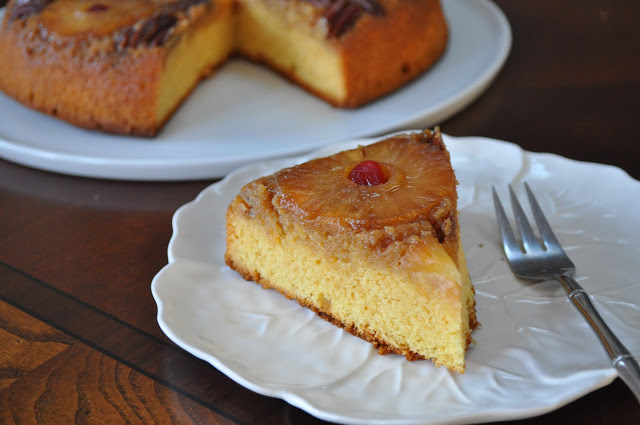 A couple of times I tried making a pineapple-upside down cake from scratch. But it wasn’t the same. It didn’t bring back those memories. And sometimes, like on my birthday, memories are more important than ever — and those of you who know me personally know what I’m talking about. So I continue to use a cake mix for this cake and for this cake alone. It is a little gussied up with some extra ingredients, so maybe that gives me a free pass for those of you who are the “cake police.” If it doesn’t, well I don’t care. I’ll continue to make it my mother’s way, and now my way. I wish I still had my mom to bake this cake for me, but she passed away decades ago, much too early in her life. So today, on my birthday, I present the cake to you. Complete with frighteningly red maraschino cherries. Feel free to pick them out. And I would love it if you let a young child standing nearby snitch a spoonful of that gooey brown sugar-butter mixture while its melting in the pan. Preheat oven to 325 degrees. Melt the butter in a large round pan (use a cast iron skillet or a 9 x 13 pan if you don’t have a large pan like the photo.) Sprinkle brown sugar evenly over the butter. Drain the pineapple and arrange the slices evenly in the pan, covering the bottom. Place cherry halves in the center of the pineapple slices, cut side up. Place pecan pieces in remaining spaces between the pineapple halves. Combine the rest of the ingredients in a large mixing bowl and beat for two minutes. Pour batter into the pan and bake for one hour, or until the toothpick comes out clean. Invert. A cake I love. Your version with pecan nuts is fantastic. Non è importante se usi o no una miscela per torte: si possono usare oppure prepararle da sé, ma nulla ha valore come il ricordo che un sapore suscita nella memoria… Bellissima torta e soprattutto BUON COMPLEANNO , LINDA!!!! tanti auguri di buon compleanno cara Linda, che bello festeggiare con una torta così, è riuscita benissimo! 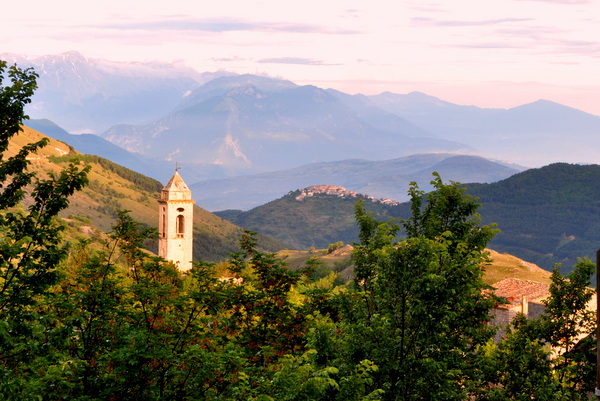 Un abbraccio…. Happy Birthday Linda! Great cake. I use cake mix sometimes too and think it is funny that in some cakes you can't tell the difference. I love those dyed marashino cherries and can eat them by the jar. I hope you are spending the day doing something wonderful. Thinking of you this October week…..what a nice treat to see that upside down cake this a.m. on my screen! and I LOVE THAT PAN! Happy Birthday Linda! I completely agree that this cake is not like our mothers' if you don't use a mix. But when I was young, we only had plain yellow cake mix, there was no such thing as pineapple cake mix. Now I've really dated myself! Your creation is picture perfect and I love that pan and its cover, too. I love that pan – hope it stays in your family forever. And I have had some mighty fine cakes in my day that used cake mixes. I've never made an upside down pineapple cake and must rectify that. Love the gooey-sticky portion of it. I bet it tastes its absolute best though – in your mother's pan. There's a pineapple cake mix? Who knew! I just inherited an old recipe box that was my aunts filled with recipes like that, I can't wait to take my time and go through it. Your memories and that pan our priceless! Have a blessed birthday Linda! I loved this post, and am wishing you a very happy birthday. Memories are the best and the things that make us smile from deep within. Cake mix? Instant pudding mix? Yikes! Nasty stuff. I thought you were a purist? It's nice to see classics like pineppale upside down cake comeback. I welcome such treats for afternoon cofee/tea. Oh, but this post brings it back. My mom also made Pineapple Upside Down cake from a base of her fave mix, Duncan Hines. And she too is decades gone – much before her time. I too recall trying to pinch some of the brown sugar and butter mix. She'd let me have a teeny bit, sort of pretending not to see. What a cake. What memories. I hope you had a marvelous birthday! And that is one very cool pan. 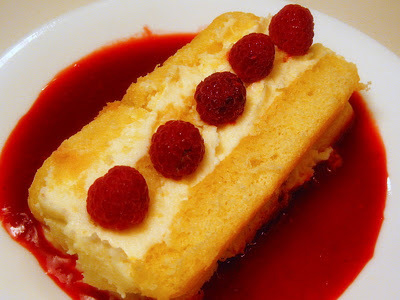 A lovely pan, cake and memory of your mother. I love making foods that remind me of my late mother also. How every pretty that cakes looks. And the fact that you can still make it in your grandmother's cake pan is wonderful! Sorry I missed theis post, Linda, but I'm glad I was able to wish you a happy birthday on facebook and I know you spent it in a lovely way. 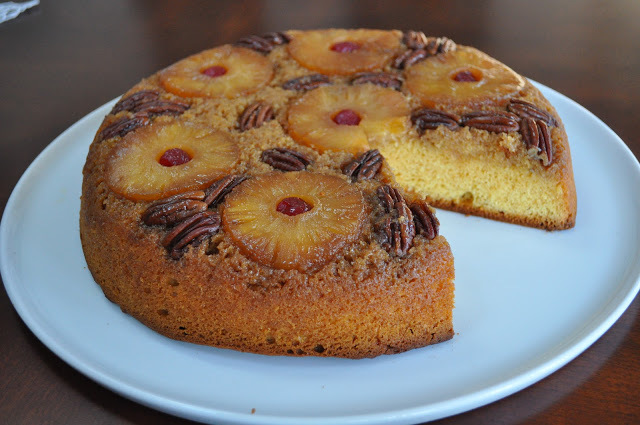 I use cake mizes from time to time and pineapple upside sown cake is one that I use them for. I like you addition of pecans and I love your Mother's pan and your memories of her. This is my favorite. Can you tell me the size of the pan you use?